Ayurveda, Mind And Body Relaxation Ayurveda is the oldest form of medicine in Sri Lanka and is still widely practised throughout the country. Everything in Ayurveda is validated by observation, inquiry, direct examination and knowledge derived from the ancient texts. Thus it has proved time and time again, to have healing powers greater than those seen in western medicine. Ayurveda is a holistic system of medicine. It sees that the two main areas that affect our health and wellness are the foods we eat and the lifestyle we live. By changing our nutritional protocol and lifestyle, we can greatly influence our physical, mental, and emotional health. The word Ayurveda means “the knowledge of life”. It is not merely a form of medicine that deals with the physical body alone. It understands that there are energetic forces that influence nature and human beings and sees a strong connection between the mind and the body. 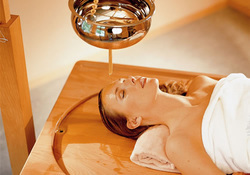 Therefore Ayurveda treatment also involves methods of relaxation, meditation and stress relief. There are a few Health Resorts in Sri Lanka today that specialise in Ayurvedic treatment. Herbal baths, massages, eye-baths and various other Ayurvedic techniques are employed in these resorts. Meditation and short lectures on Ayurveda are offered for those who wish to explore the subject at greater detail. The Siddhalepa Ayurveda Health Resort is one such establishment. If you’re looking for a bit of peace and tranquility, an Ayurveda Health Resort might be the holiday getaway made for you!